I can’t sleep right now. Tonight my alma mater received the worst news a college can get: the body of a student who had been missing for five days was found in Lake Michigan. This devastating revelation followed four intense days of high emotion, tons of interest and coverage from national and local media, and constant decisions around my department on how to deal with the developing story and keep the community informed. The University’s overall handling of this situation is a point of personal and professional pride for me, as I think it was dealt with in a graceful and appropriate manner that brought the community together under one of the worst imaginable conditions. That said, I’m saddened to my core by the outcome and the fact that this happened at all. Life is precious. I’ve thought a lot lately about how blessed I am, and the events of this week have made that even more evident. I was attending an alumni event in Lincoln Park tonight when I was notified that I might have to return to work for breaking news. While driving to a friend’s place for dinner, I received word that “the breakingest of breaking news” had broken and I was needed ASAP. After picking up a coworker and returning to my office around 9 p.m., the reality of the situation started to hit home. Hundreds of people had searched for this person and countless more had prayed for his safe return. It was now our job to spread the sad final reality. Broadcast news trucks from every local station invaded campus and set up camp outside our office. Reporters I had grown up watching were milling around and asking me for information. My boss had the unenviable task of standing in front of the cameras and reading the statement for the 10 p.m. newscast. Everyone has seen sad situations like this play out time and time again, but I had never before experienced it so acutely, been so enmeshed in the minutiae of the process or watched it affect a community that is so dear to me and has become such an integral part of my life and identity. Looking beyond the grief–or perhaps looking squarely at it–I see a genuine unity that the Northwestern community has most likely always possessed, but that can sometimes be difficult to locate amid the busy pace of a highly competitive research institution. It goes beyond passionately singing the fight song after a Cardiac ‘Cats victory or a handful of people wearing purple on a Friday. It’s the 300 students who showed up on a Thursday evening–the first day of classes, no less–to form a search party for a student they had probably never met. It’s the prayers and well wishes for the student, his family, his friends and the entire NU community that began on Monday and continue to flood Twitter and my Facebook newsfeed from current students and alumni. It’s strength and unity in the face of loss. It’s the reality that a passionate and connected community can stand up to death and use it as a positive force for solidarity and support. It’s so affirming to know that, when put to the ultimate test, Northwestern is that kind of community. As for me, I can’t stop thinking about the student and everyone who loves him. I remain blessed that the specter of death has not touched my family and friends in such a shocking, heartbreaking way. It’s something no parent, sibling, friend or loved one should ever have to experience. All we can do now is offer prayers and support. As Northwestern continues to grapple with a grief we all share, I pray that we continue to support one another in eventually achieving that peace that is past understanding. 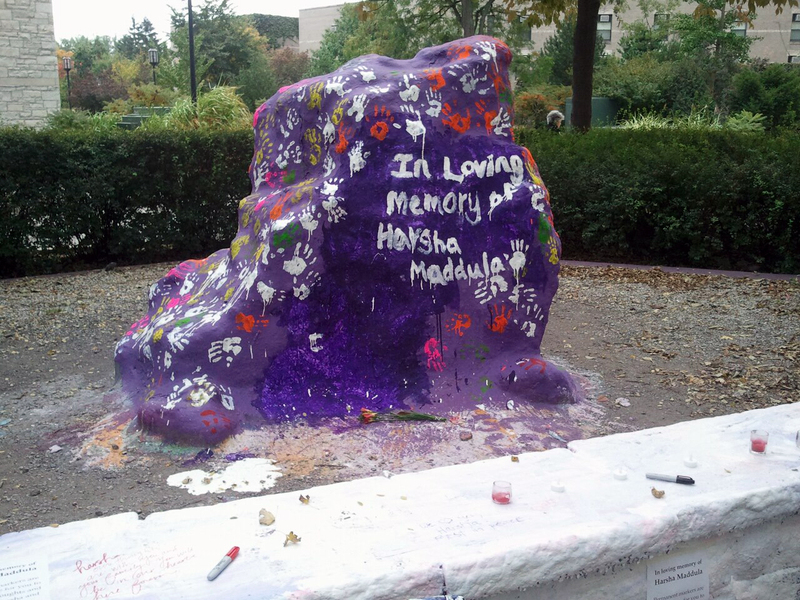 Rest in peace, Harsha.